Prime Minister Voreqe Bainimarama with Government officials at the NDMO office at Nasilivata House on January 7, 2019. 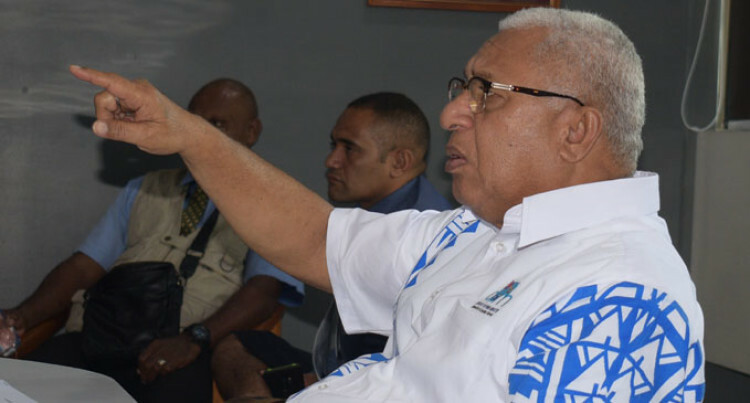 Prime Minister Voreqe Bainimarama has urged evacuees to clean up evacuation centres before heading home ahead of the new school term. This is after a briefing for him by Government officials on the path of Tropical Cyclone Mona and the plans for moving evacuees to their homes before school starts. Despite Tropical Cyclone Mona’s slow exit from the Fiji Group, Mr Bainimarama warned Fijians to remain alert. “But it’s still a threat to the Southern Lau Group, Lomaiviti Group, Kadavu because it will still bring strong winds with rain and floods,” he said. resumed as normal from yesterday. Meanwhile, two Cabinet ministers have highlighted the work carried out by their ministries in the aftermath of Tropical Cyclone Mona. Minister for Infrastructure, Transport, Disaster Management and Meteorological Services Jone Usamate and Minister for Health and Medical Services Dr Ifereimi Waqainabete updated Mr Bainimarama during the briefing. Mr Usamate said there would be teams assessing the response of people towards disaster warnings. “There will be teams going around evacuation centres and flooded areas to conduct assessments,” he said. “The good thing we saw was when we asked the people to move to the evacuation centres, they did move as a precautionary measure. Mr Usamate said the Ministry of Health and Medical Services had some concerns with diseases so they needed to go and inspect the evacuation centres. “We have a concern that schools need to be reopened at the same time,” he said. Dr Waqainabete said they had teams deployed to monitor evacuation centres on a regular basis, two times a day. “During these visits, we distributed some WASH and sanitation kits,” he said. “These are kits such as tablets to purify water and things to keep our fellow citizens clean and healthy and to check if anybody was sick and needed care. The minister said despite Tropical Cyclone Mona leaving Fiji waters, they were going to visit and check the communities. “We have to make sure that the communities are not only safe, but also have adequate food and water and don’t pose a public health risk,” he said.